On a sunny day, go to the flower site with water and bowl. Fill bowl about half full. float flowers on the water, covering the surface area. Leave the bowl of flowers in the area among the flowers 3-4 hours or more if clouds move in. Take the bowl to a safe and quiet area, or fill bottles in the same location. Carefully remove flowers from the water. Using the coffee filter, filter the water into a clean bottle. Using your colored bottle/s, fill 1/2 with vodka or brandy. Carefully fill the remaining half with the flower essence and cap. Label, and keep in a cool place away from electrical sources. It is important to ask permission from the flowers to use their essence. Use intuition or any other methods you may use to communicate with them. Thank them when you are done. Most of our traditional healers asked permission and thanked the earth when taking game or Herbs. Leave more flowers than you take. If there are not enough flowers, move on or wait. Imagine the energies being produced from a field of wildflowers, verses only 5. The mother essence can be recharged by gently shaking the bottle and tapping the bottom against your hand. 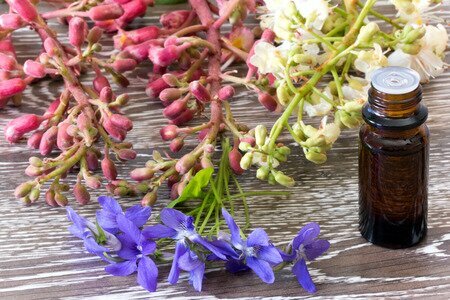 To dilute into a stock essence, add 5-7 drops of mother essence into a bottle of 50/50 water/alcohol. The vibration will be carried over. Some say it is even more potent (less is more).